A half-size muffuletta from the Napoleon House in the French Quarter of New Orleans. In my search for New Orleans’ best muffuletta, I can now cross off another entrant: Napoleon House. I stopped by this French Quarter establishment for lunch in mid-February. It was a bit before the noon hour, so the rush hadn’t hit, but as a single diner, I decided to eat at the bar. The historic restaurant is located at the corner of St. Louis and Chartres street, just two blocks from Jackson Square and on a diagonal from the Louisiana Supreme Court building. With a front door that sits on the corner, you can watch a lot of the world walk by on a pleasant New Orleans day, and the French Quarter location makes geting there very easy for those out seeing the sights. Having stated my desire to find the city’s best muffuleta, two fellow bloggers recommended I try Napoleon House. My quest to find the best may take a lifetime. There are two iconic sandwiches in New Orleans — the po’ boy and the muffuletta — so there are dozens, if not hundreds, of restaurants that offer one or both. For the uninitiated, a traditional muffuletta is Sicilian sandwich featuring salami, mortadella, ham, plus mozzarella and provolone cheeses, all topped with a (green) olive salad. It gets its name from the type of bread it is served on, which is round sesame bread. The loaf — and thus, the sandwich — is quite large, so it is often ordered in halves or quarters. If you order a whole sandwich, you’d better be really hungry or brought a friend or two with you! I ordered a half sandwich at Napoleon House, and that was plenty for me. However, bigger eaters may want to order something extra, since it came with just a pickle. This sandwich was served warm, while many other versions are not. The bread was OK — not really dry, but it was thick enough that it added a lot of bulk to the sandwich without really adding a lot of great flavor. The meats were good, although not overloaded. The cheese was melted and tasty. The olive salad spread had a nice tang to it and wasn’t overly oily, which can happen with some muffulettas. From my tastings, Cochon Butcher in the CBD (930 Tchoupitoulas St.) remains the NOLA muffuletta champion. They cure their own meats, and the sandwich had a much more robust flavor. Plus they have a whole host of original and varied side dishes. For my full review of CB’s muffuletta, see this post. And I’d pick the original version at Central Grocery, 923 Decatur St., over the sandwich at Napoleon House. Central Grocery’s version is overflowing with meat, and the olive salad is very flavorful — if a bit too oily. 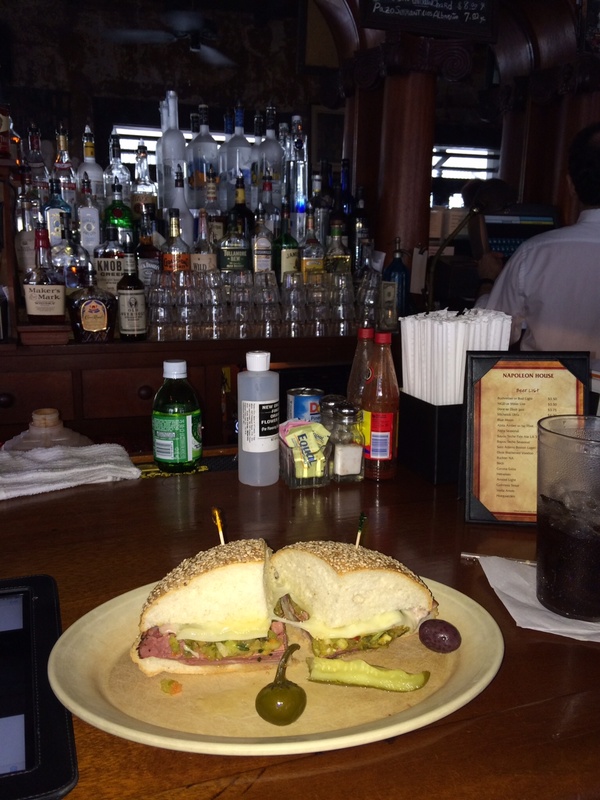 Overall, the Napoleon House muffuletta was OK — better than eating at Subway, but that’s pretty faint praise. Another list of NOLA’s five best muffulettas. GoNola’s take on muffulettas, including the mini muffulettas at Rouses Supermarket. Another list of six NOLA area restaurants offering the muffuletta. Is it muffuletta or muffaletta? Good advice: Go with the spelling used by the original. A recipe for a muffuletta. A well constructed and tasty muffaletta, Cajun potato salad and an Abita beer at Cochon Butcher. Iowans visiting New Orleans enjoy lunch at the Cochon Butcher, 930 Tchoupitoulas St. From left are Jack Rogers, Chuck Abell, Mike Klauser, Mike Girard and Mark Smidt. This panoramic shot shows the scope of Cochon Butcher in the Warehouse District of New Orleans. The gauntlet was laid down in a NOLA.com article quoting the editor of a national food magazine: Cochon Butcher serves up New Orleans’ best muffuletta. Well, Central Grocery gets the publicity and deserves the title based on longevity alone, so I had to find out for myself who was the best — or at least the best between the several I’ve tasted. Between Cochon Butcher and Central Grocery, there is no comparison: Cochon Butcher wins hands down. The sandwich was a manageable size. Some versions are so huge that they can be split two, three or even four ways. I managed to eat CB’s sandwich myself, but some of my companions split their’s. CB’s bread has a delicate crust to it, and a light and buttery flavor inside. The green olive oil spread was tasty and light, not a drippy, overpowering mess. And the meats — pastrami, salami, ham and house meats — were what you would expect from an authentic butcher shop: tasty and plentiful. Some muffulettas will come with more meat, but none will come with better tasting meat. I paired mine with Cajun potato salad, which was wonderful. It was like a German potato salad, but featured Creole mustard. My friends ordered coleslaw — also good — and the Pancetta mac and cheese, which was worthy of the trip by itself. If you have to, split the mac and cheese with a friend or take the leftovers with you. Cochon Butcher also offers a full bar — this is New Orleans, after all — with plenty of wine and local brews. The sandwich, side and Abita beer cost me less then $20. If you’re a New Orleans tourist, Central Grocery, located along Decatur street at one edge of the French Quarter, will be easier to find. Cochon Butcher is located two blocks from the World War II museum, which is about a mile from Canal Street. The museum is easily reached via the St. Charles streetcar and then a short walk. The museum is another attraction that should not be missed and worthy of most of a day. Cochon Butcher’s address is listed as 930 Tchouplitoulas St., although that is actually the address for the companion restaurant, Cochon Restaurant. To reach Cochon Butcher, keep going down Higgins Drive for one more door. It has just a few indoor tables and bar seating, along with a few more sidewalk tables. We arrived just after noon one weekday, and we grabbed a table, but the place filled up fast. The muffuletta, a unique New Orleans sandwich, can be found at many restaurants around town, but I doubt you’ll find one that’s better than the one at Cochon Butcher.